Elizabeth Andrews High senior is the student School Board representative for May. 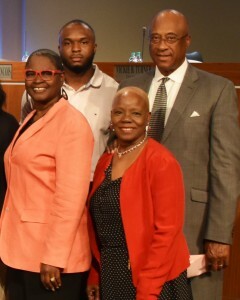 Student Board Member Arnold Palmer with Board Members Vicki Turner, Dr. Joyce Morley, & Board Chair Dr. Melvin Johnson. Arnold Palmer, a senior at Elizabeth Andrews High School represented all DeKalb County School District students at the May 15 meeting of the DeKalb County Board of Education. Arnold has a 3.6 GPA and plans to major in computer science or computer engineering in college. He is considering attending college at Georgia Tech, Emory University, Clark Atlanta University, or Carnegie Mellon University. Arnold came to the United States in July 2015. He is originally from the Netherlands, and speaks both Dutch and English fluently. He also plays semi-pro football and has been an avid tennis player for 11 years.